Public diplomacy is on the rise, writes Nancy Snow in Global Communication: Theories, Stakeholders and Trends (John Wiley & Sons, 2014). While not directly linked to place branding – at least not from a management or marketing perspective, public diplomacy is a term closely linked to nation branding. 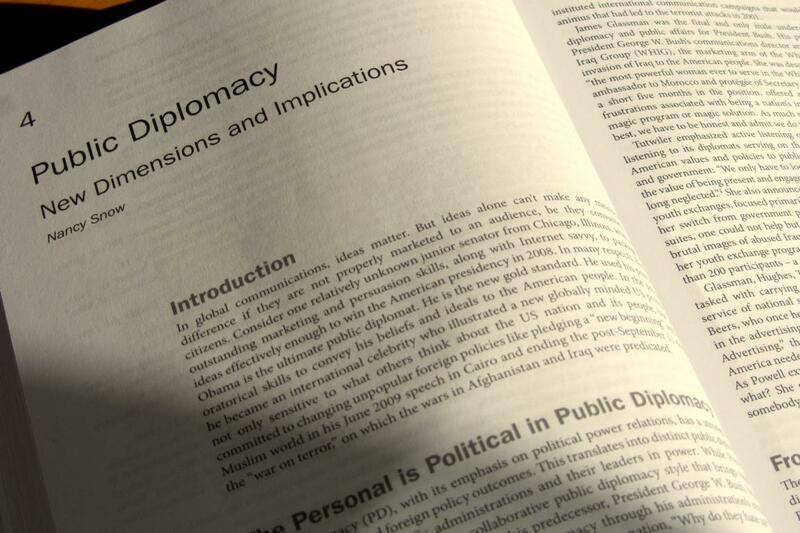 Snow’s book chapter offers a useful introduction, history and outlook on the way ahead for public diplomacy. Public diplomacy is a global process oriented toward diplomacy to publics. Snow, N. (2014). Public Diplomacy: New Dimensions and Implications. In T.L. McPhail (Ed. ), Global Communication: Theory, Stakeholders, and Trends (Fourth ed., pp. 64-79). Chichester, United Kingdom: John Wiley & Sons, Inc.
You might also be interested in our list of recommended reading for place branding professionals.